Microsoft’s cloud-based SQL Azure Reporting lets companies publish and view reports without having to maintain hardware. Get an overview of the service, now in a community technology preview. As part of a continued effort to expand its cloud-based services, Microsoft recently released the community technology preview of SQL Azure Reporting, a report hosting and rendering service built on the Windows Azure platform. Like SQL Server Reporting Services (SSRS), SQL Azure Reporting delivers operational reports -- based on Microsoft’s report definition language (RDL) -- along with a variety of rich formatting and data visualization options. In fact, it is built on SSRS technology. The primary difference between the two, other than one being a cloud-based service as opposed to a desktop application, is that SQL Azure Reporting can use only Microsoft SQL Azure databases for its data sources. When you host your reports on the service’s platform, users can view them through Web browsers, on-premises applications and applications in the Windows Azure cloud. However, to deliver those reports, you must create and publish them to the SQL Azure Reporting platform and set up the service’s environment, and that starts with having a basic understanding of how the report-delivery components fit together. After you sign up for SQL Azure Reporting in Windows Azure, you can use the SQL Azure Reporting Portal to perform the tasks necessary to manage your environment and your reports. Your first task will be to set up a report server, which is comparable to setting up one for SSRS. You host the reports on the server, and the applications necessary to view those reports connect to the server. Figure 1 illustrates how the report delivery process works. Figure 1. 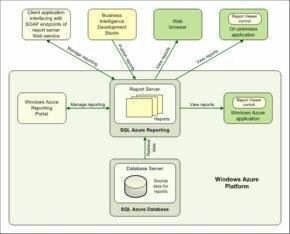 SQL Azure Reporting offers cloud-based reporting in Windows Azure. You can also use the SQL Azure Reporting Portal to manage users and permissions, create shared data sources and download execution logs. In addition, you can upload reports through the portal; however, those reports are not verified as rigorously as reports deployed through SQL Server Business Intelligence Development Studio (BIDS), the primary development tool for SQL Azure reports. Another option for managing the environment is using an application that interfaces with the Simple Object Access Protocol (SOAP) endpoints of the report server’s Web service. This method lets you perform common administrative tasks such as configuring shared data sources, creating users, setting permissions and managing reports. The primary tool for developing and deploying reports to SQL Azure Reporting is the SQL Server 2008 R2 version of BIDS. If you know how to develop reports in BIDS (using the Report Designer feature), the process for creating SQL Azure reports will be familiar. You have access to the complete set of formatting and visualization tools -- such as maps, charts and gauges -- as well as the ability to report parts, shared data sources and shared data sets, just as you do in SSRS. When SQL Server 2012 is released, you should also be able to use the SQL Server Data Tools --formerly known by the code name Juneau -- to create and deploy reports to the SQL Azure Reporting server. As with BIDS, SQL Server Data Tools should include the formatting and visualization components available in BIDS. Another option for creating reports is Report Builder 3.0. However, you cannot deploy to the report server directly in Report Builder. Instead, you can take one of two steps: Move the reports into BIDS and deploy from there or upload your reports using the SQL Azure Reporting Portal. 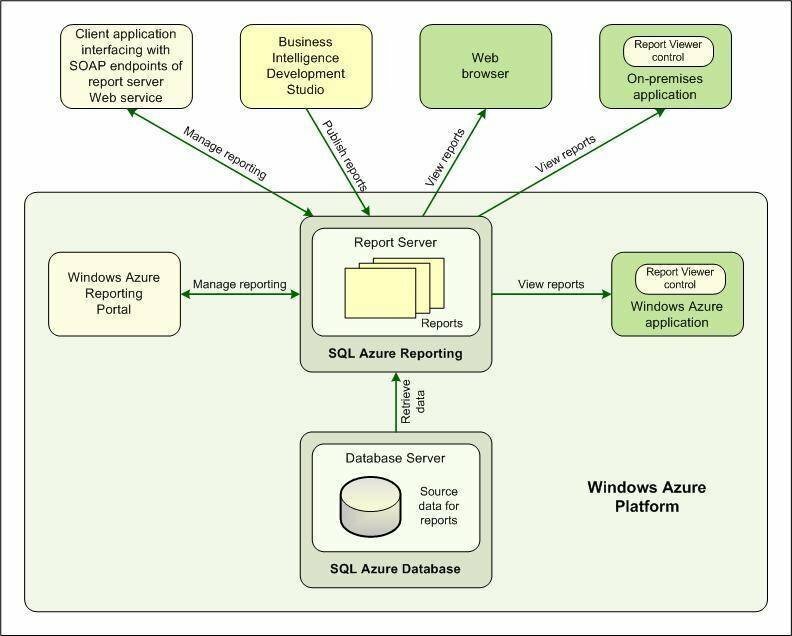 SQL Azure Reporting supports several methods for viewing reports, as shown in Figure 1. The quickest and easiest way is through a Web browser. The user simply navigates to the report via the URL that connects to the report server and signs in with the necessary credentials. Users can also view reports through applications that have the Report Viewer control embedded in them. Report Viewer is a .NET control that lets you display a report within an application. When the control is set to remote mode, it can point to a SQL Azure Reporting or SSRS report server. For SQL Azure reports, you can use an on-premises ASP.NET or Windows Forms application or an application implemented on the Windows Azure platform. Together, the components described here provide organizations with the means necessary to host and present their reports in a cloud environment. No longer do they have to provision or maintain the hardware necessary to provide reports to the people who need to see them. Because SQL Azure Reporting is hosted in Microsoft’s data center, organizations need only sign up for the service and create reports. Well, that and pay for the service. But for those that have been unable to deliver critical business intelligence data because of limited infrastructure, cloud reporting could prove to be the ideal offering.